In chapter 6 of Isaiah, he describes his encounter with the Lord God. He says of himself, "Woe is me, for I am undone! Because I am a man of unclean lips, And I dwell in the midst of a people of unclean lips; For my eyes have seen the King, The Lord of hosts" (6:5, New King James). There is a reason I'm going here. Here's an Old Testament figure, who knows nothing about Jesus Christ, or that He will take care of His people's sins, that of Israel, if they only believe Him and what He does according to what He sees the Father doing (see John 5:19). Considering this, then, Isaiah is saying that for the person who keeps himself planted in the Lord (meaning Jesus), thinking on the things He has done on our behalf, this man is kept in peace. Is there any wonder why Jesus said, "Peace I leave with you. My peace I give to you. I do not give to you as the world gives. 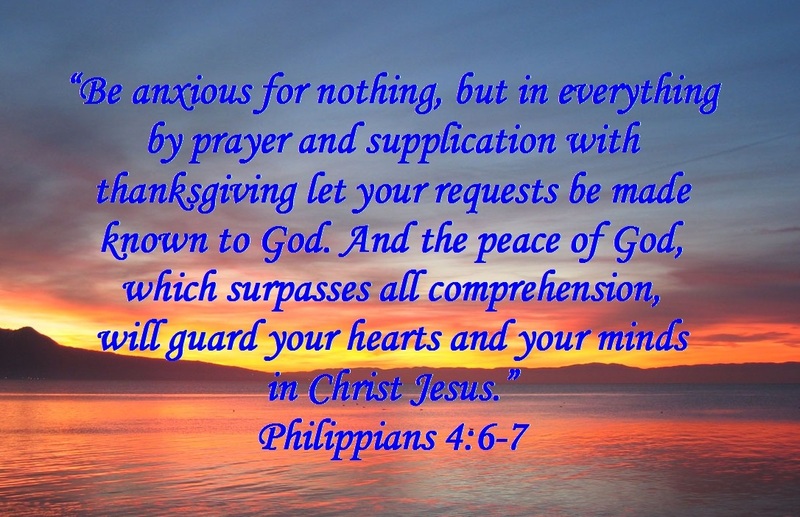 Your heart must not be troubled or fearful" (John 14:27)? But to have this peace, to have a mind that is on Christ and in His works on the cross, means there is a price that has to have been paid. Jesus Christ paid for this. It is up to us to believe that not only did He destroy the works of sin and death, that not only did He do it for us (which is what grace is: undeserved favor), but that we have an attitude and air of "I don't want to sin any more." Without making up our minds (repenting) to do away with our sin, allowing God and His word to convict us, there is no reason for sin and death to be removed from us. We have to have faith in the works of Jesus Christ, who was sent from God, the Father, to put sin and death on display at the cross of Calvary. Let me see if I can illustrate this better. A father had a priceless vase sitting in the family home. He tells his son to be careful for the vase cannot be replaced or there will be consequences for the action of breaking the vase. The son doesn't mean to do it, but he ends up breaking that vase. Whether it was done with intent or not, the son has broken this rule his father told him. Likewise, we have broken the rule God put in place to govern us. We may or may not have meant to break those rules, but it happened. For this reason we are under judgment, and it's righteous judgment. With God, the Father, just punishment for breaking even just one of His commands is death. Paul says, "Don't you know that the unrighteous will not inherit God's kingdom? Do not be deceived: No sexually immoral people, idolaters, adulterers, or anyone practicing homosexuality, no thieves, greedy people, drunkards, verbally abusive people, or swindlers will inherit God's kingdom" (1 Corinthians 6:9-10, Holman Christian Standard). We are unrighteous. So, God's judgment is just upon us since we are under the curse of sin and death. Either we pay the price or Someone has to so we can enjoy a restored relationship with the Father. Enter Jesus Christ. Isaiah later says in chapter 53 that a man will be handed over. He will be a man of sorrows (v. 3), bruised for iniquity (v. 5). He will be given stripes (v. 5, see John 19:1). Also, in all things He didn't open His mouth once in harm against anyone. His mouth was shut, as if like a lamb (v. 7). If Jesus fulfills 100% of the Bible's word, God's voice to man, then it behooves us to see that God will indeed keep His word 100%. Either we turn to Him, understanding our error, humbly seeking Him to save us from our sins, or He will lay our sins on us. It's one way or the other. I can't and won't sugarcoat that. That choice is ours. But for the man who wants peace, he puts his mind on Jesus. He keeps Jesus ever before Him and His ways as well. He walks as Jesus walked, the best way he knows how. Who wouldn't want their trust in God to keep them in peace? I would. I'd rather the peace that passes all understanding. And God sent His Son, Jesus Christ, to give you peace from your sins as well as from death. I pray this finds everyone well and blesses you immeasurably. Amen.